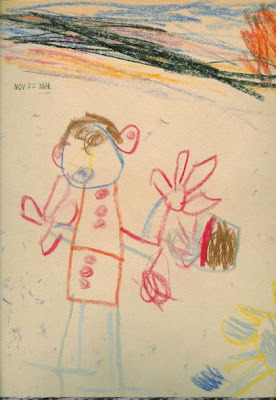 The artist was a mere 5 years old, though his artistic skills haven't improved much. I am thankful for many things from my mother. One small thing for which I am thankful is she had the foresight to type dates on my early creative attempts. Of course, this decreases the artistic value, as I am sure the world is grateful that Da Vinci's mother didn't type the date on the Mona Lisa. But I am no Da Vinci, so I am thankful for the date. John, I love your artistic talent and your wit! You had a very special Mother, indeed, to have recognized that one day your art would be shared with the world and need to be dated!